Recently hacked New Zealand cryptocurrency exchange Cryptopia has finally opened withdrawals and deposits on several major coins following months of frozen funds and the inability to deposit or withdraw from the exchange, the latest move in an attempt to salvage the exchanges reputation appears to have worked. Cryptopia today announced that it has finally opened deposits and withdrawals for Bitcoin, Litecoin and Dogecoin following month of frozen funds on the exchange due to the recent hack. The hack on Cryptopia saw mostly ERC20 tokens and Ethereum hacked from the exchange with the total affected funds said to be worth roughly $20 million. Ethereum has not been opened for deposits or withdrawals, and most ERC20 tokens remain inactive on the exchange following the hack. Cryptopia opened for trading last month with pairs being added weekly as the company continue to secure new wallets for trading. The exchange has since seen volume slowly increasing with current daily volume reaching roughly $200,000. Volume has increased 10-fold since the re-opening of trading, and it appears that the ability to withdraw funds in BTC, LTC and DOGE has not deterred users from trading on the hacked exchange. Electroneum (ETN) remains the top traded coin on Cryptopia, the coin was also the top traded coin on Cryptopia during the 2017 bull run which saw the coin do over 1000 BTC volume on some days. 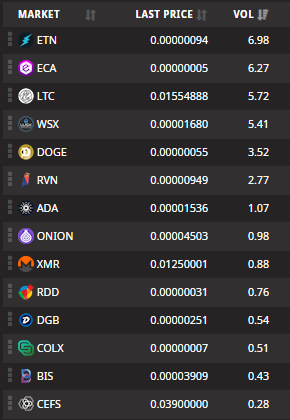 Currently the coin only has roughly 6 BTC in daily trading volume, but if Cryptopia continue to push to be fully operation this year, there is no doubt the exchange can return to its former glory days. Good Job Guys. I will give u one more shot, let's take ths relationship forward. Do you think Cryptopia can return to its former glory once it is fully reopened?